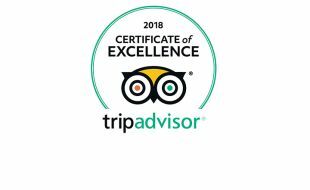 Garden Court Milpark is a proud recipient of a 2018 Certificate of Excellence award. This coveted accolade recognizes businesses with consistently high ratings on TripAdvisor. Garden Court Milpark has been selected for the 2017 Certificate of Excellence award in the accommodation category. Garden Court Milpark has been selected for the 2016 Certificate of Excellence for superior service. Tsogo Sun’s hugely successful Garden Court Milpark hotel boasts a fresh look after the completion of an extensive refurbishment and upgrade of facilities. When entering the lobby of the Garden Court Milpark hotel guests will immediately sense the vitality of the hotel, experiencing their first taste of relaxed, comfortable city loft living. The Garden Court Milpark hotel’s architectural aesthetic, slick interiors and professional facilities merge seamlessly to create an environment that is both practical and picturesque. From floor to ceiling each detail has been carefully selected to integrate into the general theme. The interior finishes, furniture and fabrics have been styled with a palette of grey, bright blue and yellow with splashes of orange and green - colours that permeate relaxation, comfort and professionalism. Plush seating in rich textures, timber furnishings; floor to ceiling full-scale wall art and glass doors and windows and ambient lighting create a sensation of spaciousness and comfort. The Rea Vaya Bus Rapid Transport system is at the heart of Joburg living and, ingeniously, some of the routes have been woven into the carpets of the Garden Court Milpark hotel, using design and colour to provide guests with a “route map” to their rooms. Additionally, Crispin Sparg Photographers was tasked with identifying a range of iconic Joburg buildings to use for the wall art in the public spaces and fitness centre. Upon entering the bedrooms, guests are treated to a view of the Joburg skyline. As the hotel is situated in the academic precinct of Joburg and does not have a natural view of the skyline, Arris Creative designed and custom-made curtains displaying the skyline, once again carrying the theme of the hotel through to the guestrooms. The “skyline” curtains dually serves as the artwork, therefore providing a clean uncluttered space for relaxation. The on-suite bathroom were completely gutted and rebuilt and now sport a perfect combination of white, grey and splashes of bright blue imparting a sense of space and purity. Additionally, the glass shower partition is embossed with a blue rendition of the skyline. Tsogo Sun’s hugely successful Garden Court Milpark hotel boasts a fresh look and brand new offerings after the December 2013 completion of an extensive refurbishment and upgrade of facilities. The new design took the surrounding environment of city loft living into consideration and expresses a contemporary aesthetic with strong geometric forms and bold patterns. Popular with business and leisure guests alike, this cozy hideout situated within the academic precinct of Johannesburg, now offers even greater comfort and convenience. The massive rejuvenation project included the refurbishment of all the bedrooms, the lobby, the lounge and the corridors and the addition of two new conference venues and a new fitness centre. Brand new room types have been introduced and the hotel now offers 76 Standard King and Standard rooms as well as 140 Family rooms, including 12 Superior rooms, 19 Deluxe rooms and four Executive rooms. The Executive rooms offer a small open plan lounge and kitchenette with semi self-catering facilities. Additionally, the refreshed breakfast room promises guests a comfortable and welcoming start to the day. Furthermore, the Garden Court Milparkhotel now features a state of the art conference offering with the unveiling of three new conference facilities, seating up to 140 people, as well as the upgrade of existing meeting rooms, increasing the overall conference facilities from two to five rooms. Business travelers now have access to a range of services designed to make business travel easier and simpler. 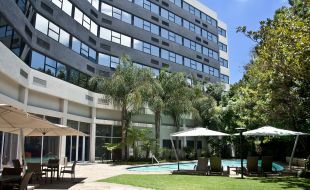 Located off major through roads and only 30 minutes from O.R Tambo International Airport, Garden Court Milpark is a convenient and comfortable city hotel, centrally located to enable guests the opportunity to easily explore the trendy hot spots that Johannesburg has to offer. “The rejuvenation of the hotel promises guests a memorable experience which is enhanced with our consistent high standards of service. The new conferencing offer was driven by the demand for quality venues close to the city and surrounding attractions and we have no doubt that the new additions coupled with the refurbishment will meet and exceed our guests’ expectations”, said Noël Macquet, General Manager at the Garden Court Milpark. Conference packages at Garden Court Milpark’snew venue start from R325 per person. And full day conference package includes three tea or coffee breaks & lunch, a PA system with line microphone, data projector and screen, lectern, pens and note-pads. Tsogo Sun’s hugely successful Garden Court Milpark hotel boasts a fresh look and brand new offerings after the December 2013 completion of an extensive refurbishment and upgrade of facilities. The new design took the surrounding environment of city loft living into consideration and expresses a contemporary aesthetic with strong geometric forms and bold patterns. Popular with business and leisure guests alike, this cozy hideout situated within the academic precinct of Johannesburg, now offers even greater comfort and convenience. The massive rejuvenation project included the refurbishment of all the bedrooms, the lobby, the lounge and the corridors and the addition of two new conference venues and a new fitness centre. Brand new room types have been introduced and the hotel now offers 76 Standard King and Standard rooms as well as 140 Family rooms, including 12 Superior rooms, 19 Deluxe rooms and four Executive rooms. The Executive rooms offer a small open plan lounge and kitchenette with semi self-catering facilities. Additionally, the refreshed breakfast room promises guests a comfortable and welcoming start to the day. Furthermore, the Garden Court Milpark hotel now features a state of the art conference offering with the unveiling of three new conference facilities, seating up to 140 people, as well as the upgrade of existing meeting rooms, increasing the overall conference facilities from two to five rooms. Business travelers now have access to a range of services designed to make business travel easier and simpler. Located off major through roads and only 30 minutes from O.R Tambo International Airport, Garden Court Milpark is a convenient and comfortable city hotel, centrally located to enable guests the opportunity to easily explore the trendy hot spots that Johannesburg has to offer. “The rejuvenation of the hotel promises guests a memorable experience which is enhanced with our consistent high standards of service. The new conferencing offer was driven by the demand for quality venues close to the city and surrounding attractions and we have no doubt that the new additions coupled with the refurbishment will meet and exceed our guests’ expectations”, said Noël Macquet, General Manager at the Garden Court Milpark. Conference packages at Garden Court Milpark’s new venue start from R325 per person. And full day conference package includes three tea or coffee breaks & lunch, a PA system with line microphone, data projector and screen, lectern, pens and note-pads.